Sadly, we often are rough. We spend so much time patching people up that pretty soon we’re like factory workers putting bolts on a widget. It’s a form of “compassion fatigue.” We’re faced with so much sadness and suffering that we slowly, subconsciously, learn to hold our patients at a distance. But somehow, some patients, some situations, find their ways deep into our hearts. This weekend I was changing a dressing on a particularly nasty bed sore on a sweet young lady that is close to my age. The sore was so nasty, and the patient so young that I couldn’t help but my let my heart go out to her and to feel pained for her situation. I did my best to let her see and feel my empathy and made sure to talk to the next shift about a few things that could be done to make her more comfortable. To respond to my friend’s comment, we health professionals are also fragile people, but we’ve wrapped our hearts away so that we can do our jobs professionally and efficiently. But we’re grateful for comments like yours, and for patients like mine that remind us that we’re all fragile people. Posted in Compassion and tagged compassion fatigue. Bookmark the permalink. The New York Times reports on a very disturbing case in Texas. A doctor allegedly engaged in all sorts of malpractice. When a nurse reported him to the medical board, she lost her job and he kept his. Sad but not that surprising. What’s surprising is that she is now being prosecuted for reporting him even though investigators and hospital administrators admit that the doctor engaged in malpractice. The prosecutor claims that she was trying to diminish his reputation. Really? It’s not like she went to the newspaper. She reported him to the medical board who could then open an investigation on their own. Hopefully this prosecutor will wake up and drop the charges. Nurses should always feel free to report unsafe behavior. Posted in The News and tagged health policy, in the news, injustice, quality. Bookmark the permalink. I thought it was nice of the hospital to provide accommodations for nurses who wanted to stay at the hospital during this weekend of bad weather. Personally, I was not going to take them up on their offer–the hospital is a noisy, stressful place, but I was intrigued to see what rooms they were offering nurses. I figured it must be either extra space in doctor “call rooms” which have bunk beds in them or empty patient rooms. Turns out it was neither. 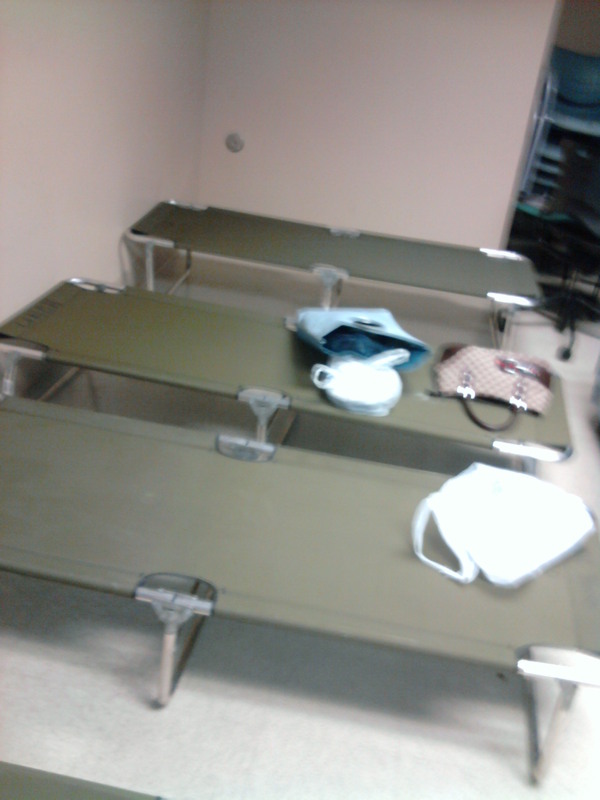 Instead, they were offering us these little cots, that are about two feet wide, lined up one after the other in a conference room off of a high traffic area. Seriously? As far as my unit goes, not a single nurse stayed in the conference room. Can you blame them? Posted in Management and tagged injustice, management, war stories, weather. Bookmark the permalink.